Above: Foggy dawn over Lake Constance, 23 Sep 2017 (HL). For over fifteen years, I’ve traveled with German Rail throughout the the country. I was always passing through the centre of the country; thanks to InterCity Express trains on journeys between Frankfurt and Berlin, I’d seen stops with names “Kassel-Wilhelmshöhe”, “Hildesheim”, and “Hannover”; and I’d wondered what there was to see in these places. I finally decided to stop and find out for myself. 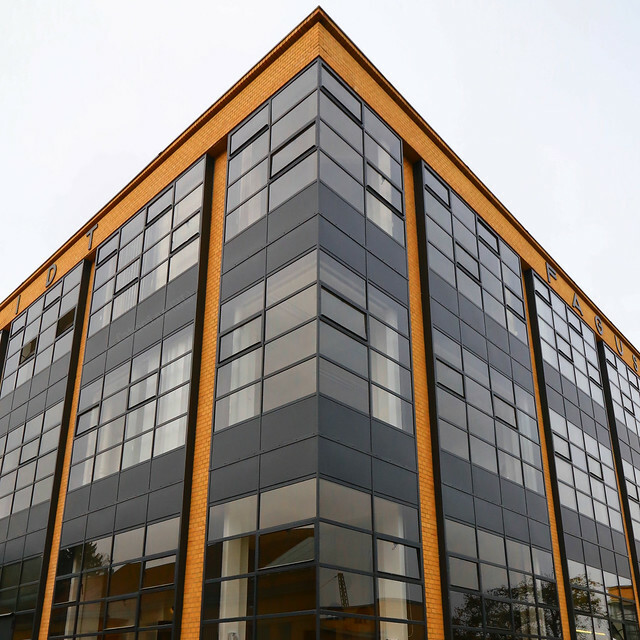 Setting a new architectural standard in 1911, the Fagus factory is considered one of the first buildings of the Modern Age, particularly with steel and glass construction, and a feature of unsupported windows at the corners of the building. Fagus company founder Carl Benscheidt commissioned architect and Bauhaus founder, Walter Gropius, to create and build a factory for making shoes. “Fagus” is Latin for “beech tree”, and shoe lasts constructed from beech wood were sold and distributed around the world in the manufacture of shoes. Today, the building is still a working factory. Fagus creates plastic lasts milled to precise specifications for specific designs by shoe companies. Also on-site is GreCon which produces systems for fire-detection and fire-extinguishing. The Fagus factory in Alfeld has been a UNESCO WHS since 2011. In the southeast borough/district of Treptow-Köpenick, the Gartenstadt Falkenberg (Falkenberg Garden City) by Bruno Taut is the oldest of six settlements around the city of Berlin. The “Garden City” is related to Ebenezer Howard’s idea of living in a cooperative settlement with access to green space. The combination of bright colours and specific building details are expressions of new (early 20th-century) architecture and urban composition. 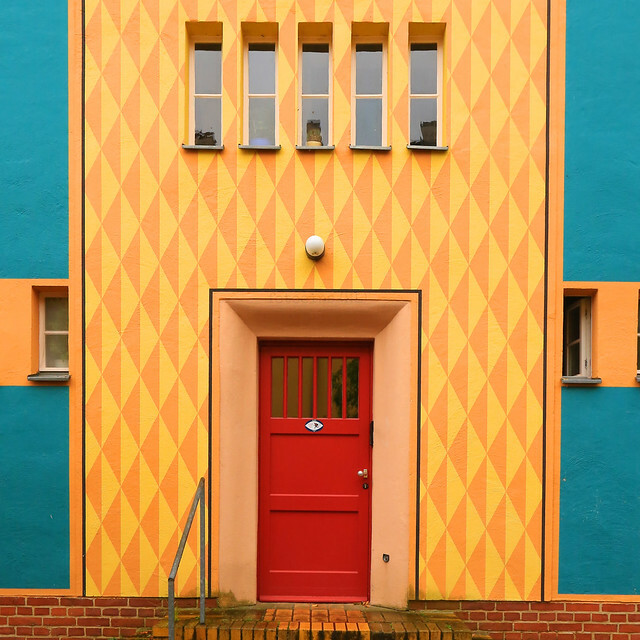 The Garden City settlement is also known as the Tuschkastensiedlung or “Paintbox Housing Estate.” A colourful example is this house at address Gartenstadtweg 29. The Modernism Housing Estates have collectively been a UNESCO WHS since 2008. In the southeast corner of the German state of Baden-Württemberg, the Swabian Jura (Swabian Alb) mountains hosts a number of caves which contains important archaeological discoveries. About 40 to 50 thousand years ago, the area was at the edge of the extended Alpine glaciation (Würm period), and was home to early humans living in caves and surrounding river valleys, including an early version of the Danube. The above picture is of the “Venus” figure discovered in 2008 in the Hohle Fels cave near the town of Blaubeuren. The sculpture is 6 centimetres (2.4 inches) tall and is a female figure dating back to about 40-thousand years. The figure is representative with a ring for the head. The prominent breasts and broad hips suggest a symbol for fertility; surface abrasions imply the figure was worn as charm or pendant. The Ice Age caves in the Swabian Alb were inscribed as UNESCO WHS in June 2017. My thanks to urmu Urgeschichtliches Museum for their kind support and permission to photograph within the museum. Based on archaeological digs in the area, mining activity and some form of ore extraction here in the northern reaches of the Harz mountains in central Germany occurred up to 3000 years ago. At Rammelsberg mountain (635 metres / 2083 feet), mining for ore had gone uninterrupted for about 1000 years until its closure in 1988. ​With an age between 360 and 420 million years old (Devonian period), the rock yielded rich deposits of minerals including copper, gold, silver, lead, and zinc. The present-day museum memorializes the mining history at this location, for the economic and cultural contributions to the region, land, and continent over centuries, and for the intact remnants to all phases of mining operations. 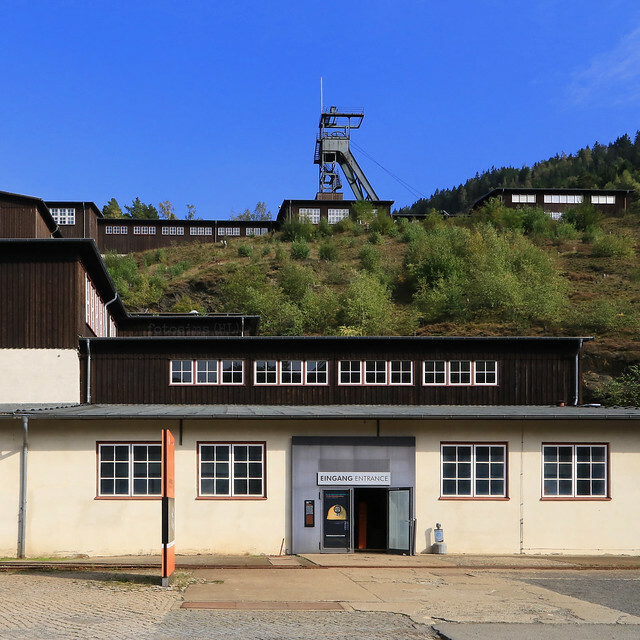 The Rammelsberg mine was inscribed as UNESCO WHS in 1992. 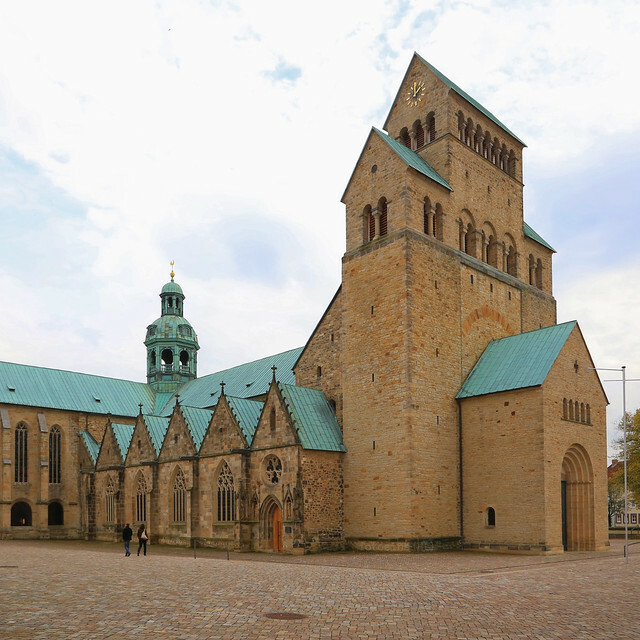 Hildesheim Cathedral (Cathedral of the Assumption of Mary) was inaugurated in 872 AD/CE, reestablished in 1061, bombed in 1945, and rebuilt in 1960. St. Michael’s Church was founded in 1010 AD/CE, bombed in 1945, and rebuilt in 1960. These two churches are examples of Romanesque architecture which were inscribed as UNESCO WHS in 1985. As one of the most important expressions of Carolingian architecture, the Westwork (at right) is the only remaining structure in the entire complex that dates back to the Carolingian era; at left is the west wing of the Baroque monastery. Corvey began life in the late-8th to early 9th-century as an idea for a church group to move beyond its borders and go on missions throughout the lands. One group in particular began their journey from house Corbie on the river Somme in present-day northern France. Thanks to Emperor Ludwig der Fromme (the Pious) and as part of Charlemagne’s initial desire to “Christianize” Saxon lands, construction began at this location next to the Weser river in 822 AD/CE. The Benedictine monastery, “Corbeia nova” (New Corbie), was inaugurated in 836 AD/CE. 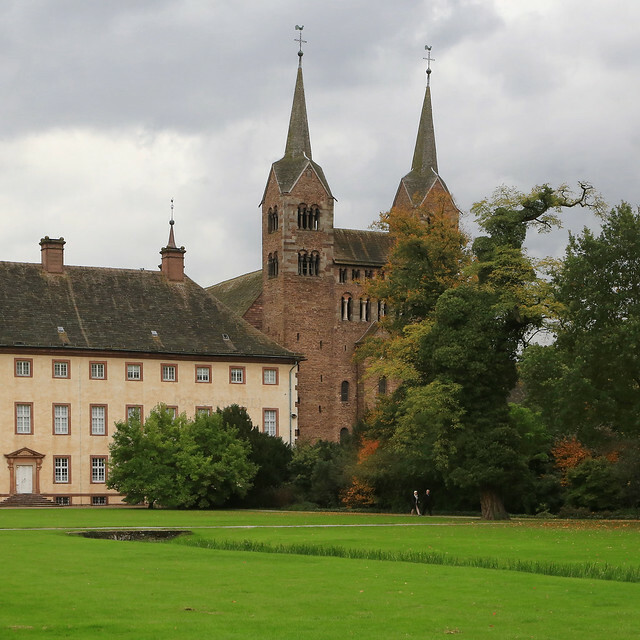 Schloss/Kloster Corvey was inscribed as UNESCO WHS in 2014. The weather forecast for German Unification Day is “variable” which is a simple understatement of this holiday: clouds, sun breaks, rain showers, and better yet, a double rainbow in the late-afternoon. 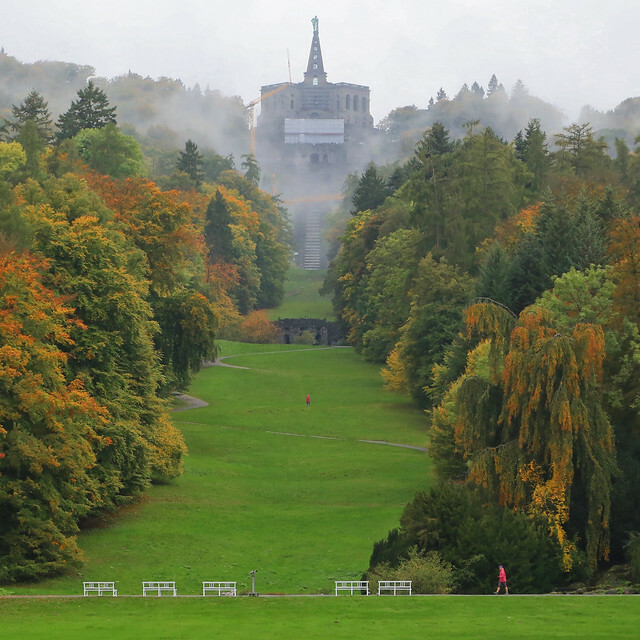 The holiday morning starts with low-lying fog and mist like a veil surrounding the Hercules statue here at Bergpark Wilhelmshöhe (Mountain Park William’s Heights). That William sure had a fine sense of place, timing, and a whole lot of coin to burn. But lucky for us, we have a present-day UNESCO WHS since 2013. This gatehouse (or royal hall) is a very prominent feature of the former Benedictine abbey whose founding goes back to the 8th-century AD/CE. The abbey contained one of the most important library collections in medieval Germany, including the “Lorsch Pharmacopoeia,” one of the first documents highlighting the importance of science and medicine in the development of new healing methods, independent of (and, where some were concerned, interfering with) the practice of the “divine plan” for healing sickness. It’s not entirely clear what the purpose of the gatehouse was for, but what’s known is that the gatehouse is one of the finest examples of Carolingian architecture and one of the oldest pre-Romanesque buildings in Germany. All that’s left today of the abbey are the gatehouse, part of the church, monastery wall, and a couple of administrative buildings. 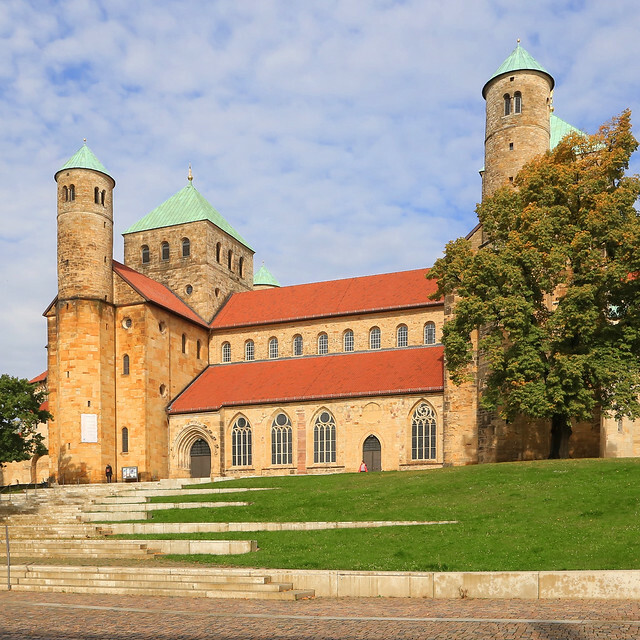 These abbey remnants and the nearby Altmünster have been inscribed as UNESCO WHS since 1991. 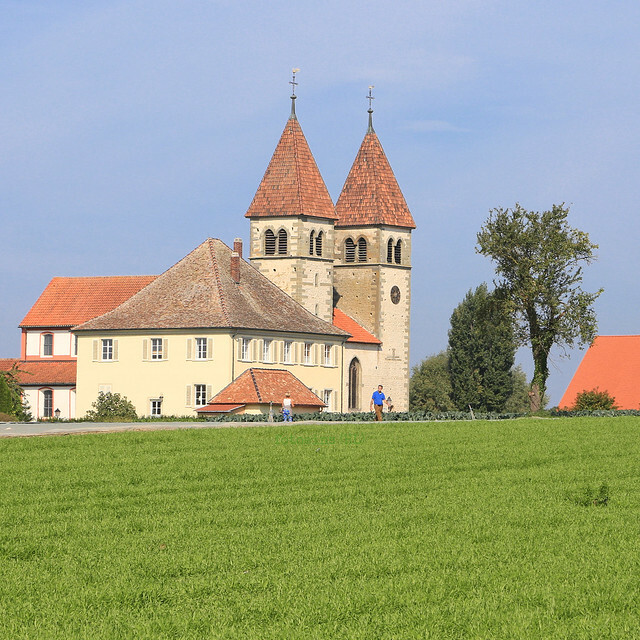 In the late 8th-century, Bishop Egino arrived from Verona and the church he founded at this location on the northwest corner of Reichenau Island was consecrated in 799 AD/CE. Rebuilding and modifications occurred over the intervening centuries until the building we see today as the Romanesque Basilica of St. Peter and Paul was built in the 12th-century; completed in the 15th-century were the church’s two towers to the east. For recognition of the island’s heritage of medieval monastic and scholarly standing, Reichenau has been a UNESCO WHS since 2000. 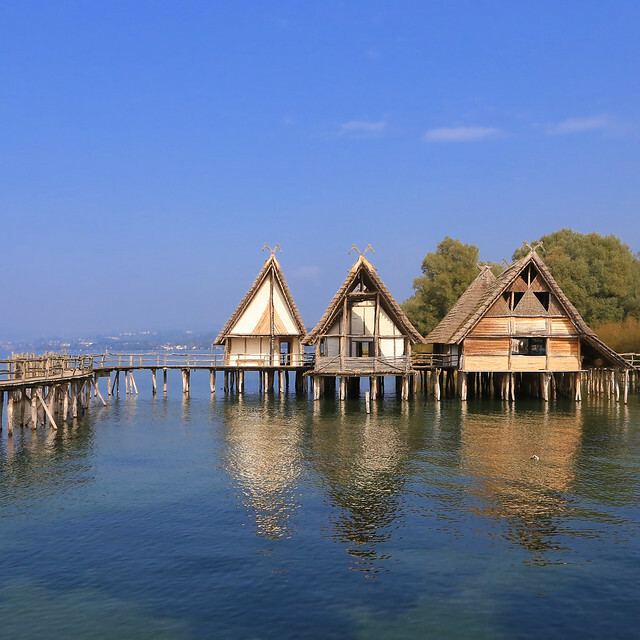 In and around what are now the Alps, humans in the Stone to Bronze Age began building dwellings with long poles (“piles”) on the shorelines of lakes for food, security, mobility, and trade. People eventually moved inland as seas rose. The lack of oxygen in deep waters meant that traces of human presence like piles and other organic remnants (e.g., clothes, food, etc.) did not suffer extreme deterioration. Found in 6 European nations, all pile dwellings are presently under water, which means access is obviously restricted. Archaeological “digs” underwater means education opportunities at the surface, including the carefully researched reproductions at the Pfahlbauten Museum on the northeastern shore of Lake Constance. Shown here are reproductions of 5 pile dwellings from the nearby Unteruhldingen-Stollenwiesen site from about 970 BC/BCE. Additional evidence of human settlement and daily life going back several thousand years provides important clues to piece together the origin story of our species. A total of 111 pile dwelling locations in 6 countries are part of the same inscription as UNESCO WHS since 2011. 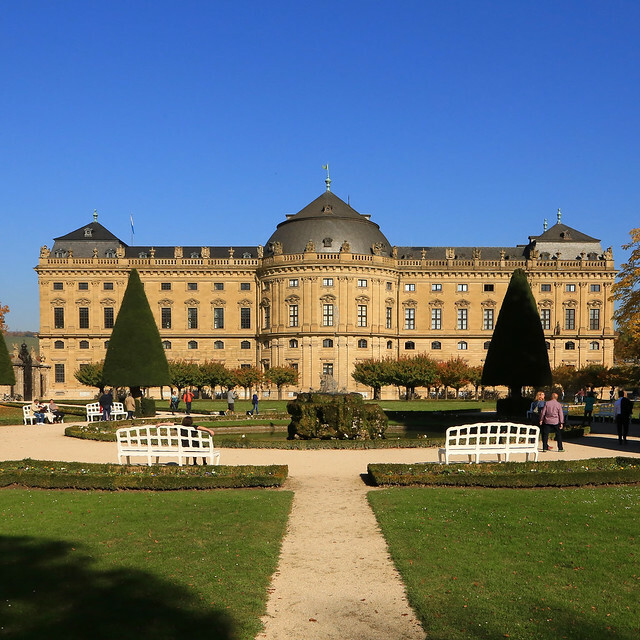 Built between 1720 and 1744, the Würzburg Residenz (Residence) was the seat of prince-bishops until the mediatization (secularization) process in 1802-1803. Today, the Residence is one of the most important baroque palaces in Europe. The surrounding Court Gardens were redesigned beginning in 1770 to fit within the city walls. In World War 2, the March 1945 bombing raid lasted less than one-half hour and destroyed 89% of the inner city including a large portion of the Residence. Art historian and US Army 2nd Lieutenant John Skilton was stationed in Würzburg from June to October 1945 as officer of the Monuments and Fine Arts Section. Thanks to his tireless efforts, support from the US Army, and experts from the city, restructuring proceeded to rebuild and save the city’s landmark. The Würzburg Residenz has been a UNESCO WHS since 1981. The map below shows the 11 UNESCO WHS visited on this last trip (in purple). Click on the arrow-window icon at the upper-left corner of the map for the legend. Between 19 September and 18 October 2017, I made over 11800 camera exposures including the 11 appearing above. The enormous number of frames sounds manic and excessive, but in truth, sounds about par. All of the pictures first appeared on my Instagram. The 11 sites above adds to the growing list of UNESCO WHS within Germany I’ve visited. This post appears on Fotoeins Fotografie at fotoeins.com as http://wp.me/p1BIdT-aA6. What a wonderful educating post, as a German born I haven’t been almost at any of those places. Thank you for sharing your travels.